This entry was posted on May 26, 2013 by Andie Pantazi. For someone who will be graduating, a common dilemma that is faced is on how to wear the academic regalia. Upon receiving the garments, you would definitely have no idea on how each of the item works and is worn; you might even have to feel uncomfortable wearing them for the first time. The based graduation regalia consists of three or more garments wherein each garment has a particular purpose and has a definite way to be worn. They may also include small parts that if they would not be given proper attention, they might be misplaced. We all want to look best during our graduation ceremony. It is the most special event in a student’s life, thus it is just right for us to properly prepare this occasion including the clothes and garments that we are ought to be wearing. Make sure that all the garments are intact, the academic regalia generally consist of a graduation gown, academic cap with tassel and an academic hood. Take note that every degree has its own academic regalia school colors and depending on its level, the garments may vary. It is therefore important to know what garments in particular to wear and your degree’s assigned color. This will prevent any further problem and complaints in the future. If everything is all set and ready, and there are no any problems regarding the garments then it would be the right time to know how these garments are properly worn. The first garment on the list to be worn first would be the graduation gown. After wearing the prescribed graduation clothes, the graduation gown is worn over the clothes. You would be able to distinguish the front of the gown since most of them have ribbons that adorn them or symbols embroidered on them. After wearing the graduation gown, wear the academic hood or stole over the gown. It should hang just over the shoulders. There are however instances where the graduation hoods are yet to be worn after the hooding ceremony conducted by the school or university. If this would be the case, do not wear the hood but carry them to hang on your left arm to the ceremony venue until the hooding ceremony is done. Lastly, wear the academic cap properly. The pointed tip must be pointing the same direction of your face. Also make sure that the tassel hangs on the correct side which would generally be the left. The tassels are actually flipped to the other side after receiving the diploma on stage. This would symbolize one’s transition from being a student to a graduate. Now that you know how to properly wear the academic regalia, it is then advised for one to purchase graduation apparel which would make you look even better during your graduation ceremony. We all want to look our best and stand out from the rest of the graduates, right? 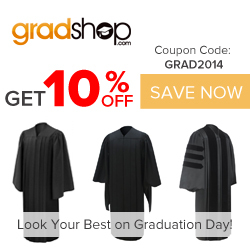 Online stores and websites like Bestbuttman have different graduation garments which you need. They have stylish, modern and most of all affordable items which are just right for you. Visit their website today and see what they have in store for you.